Drill down to the individual standard elements to find thousands of online activities mapped to standard elements. Look for a rapidly growing variety of thousands of practice quizzes tied to the Common Core State Standards, School Subjects, Activities, and Holidays. Look for a rapidly growing variety of thousands of practice worksheets tied to the Common Core State Standards, School Subjects, Activities, and Holidays. Standards based links and our grade level "Skillbuilders" to help students practice, either at home or in the classroom, what they have been taught. 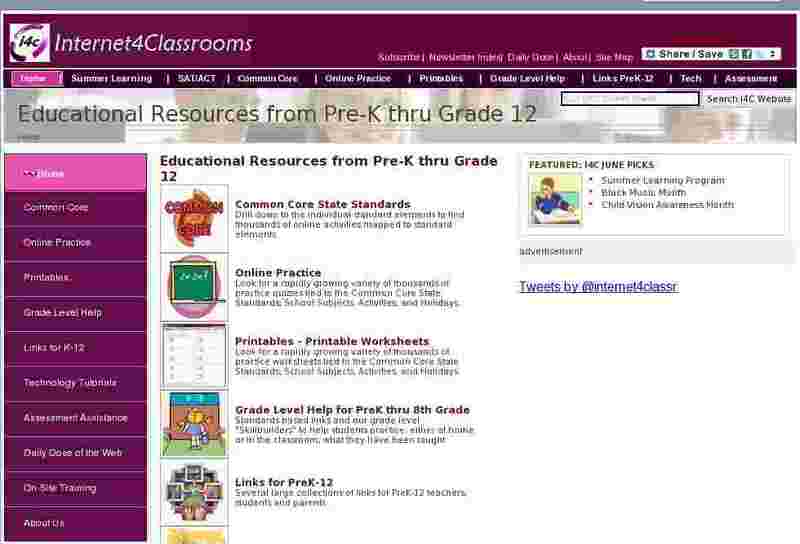 Several large collections of links for PreK-12 teachers, students and parents. Step-by-step technology tutorials for learning applications commonly used in K-12 classrooms. Help your students prepare for annual assessments, standardized tests, and end of course exams. Web sites which provide new content on a daily or weekly basis. Technology utilization and integration support sessions conducted by the founders of Internet4Classrooms. Find out more about the purpose of this site and the two teachers who founded Internet4Classrooms.